Back to the Best of Eleuthera series and one of the very best ! 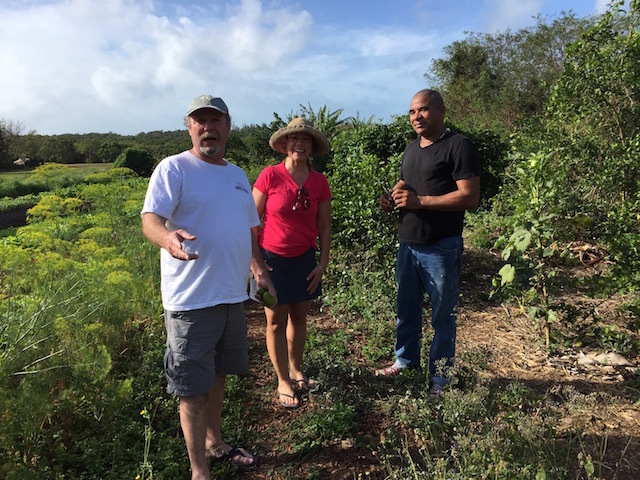 – Eleuthera Island Farm. 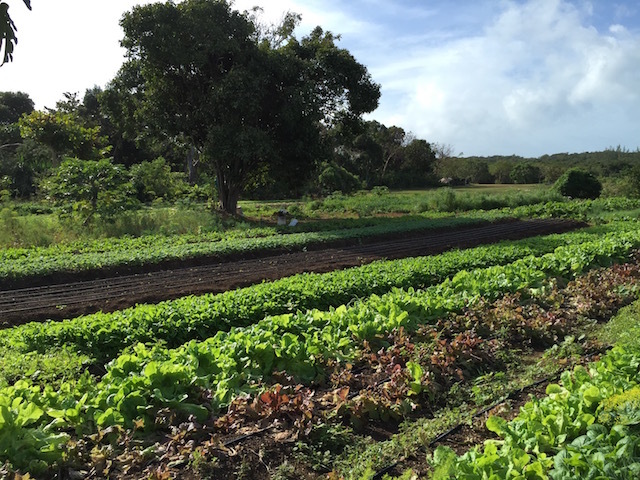 Many of you will be familiar with the farm – just south of Palmetto Point crossroads on Queens Highway. It supplies us with fabulous fresh seasonal produce, all sorts of bottled sauces and marinades and BREAD. 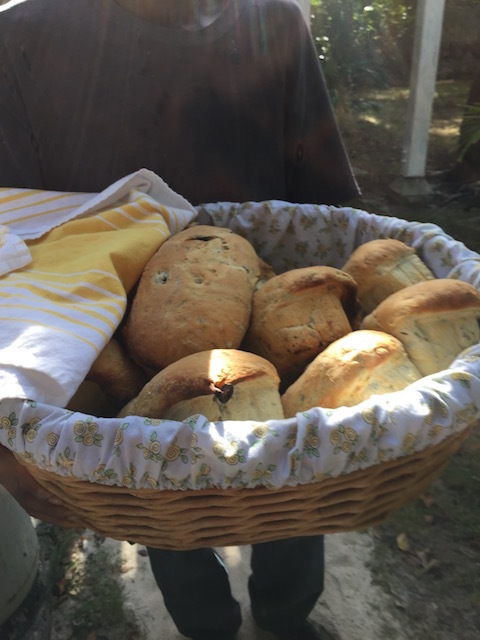 Proper bread – not squishy and full of sugar like so many processed mass produced breads – bread you want tear the crust off and eat before you get home ! One of the speciality breads – I think this one is olive ….. Owned by Clyde and Anne Bethel, the farm has been running for around 18 – 20 years – but over the last few years it has escalated in the variety of what it provides. 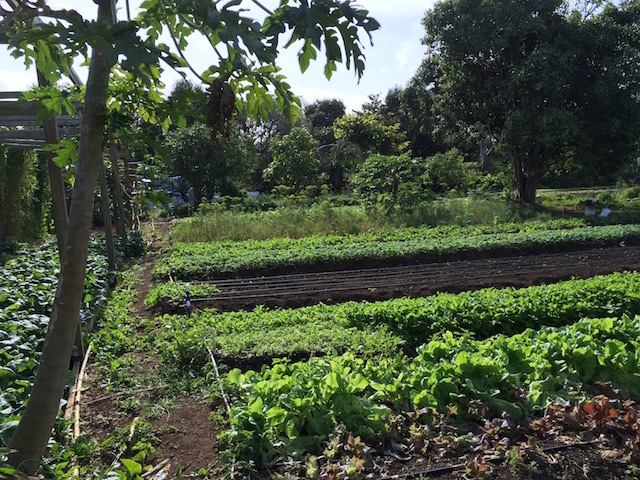 They currently have around 7.5 acres under cultivation with another 3 acres scheduled for later this year. Clyde Bethel on the right – sorry Clyde not a great picture of you – much more handsome in real life ! It is one of the top tips I always pass on to our renters as a source of the best fresh food available – and so do many other people. Tuesday mornings are a sight to see. 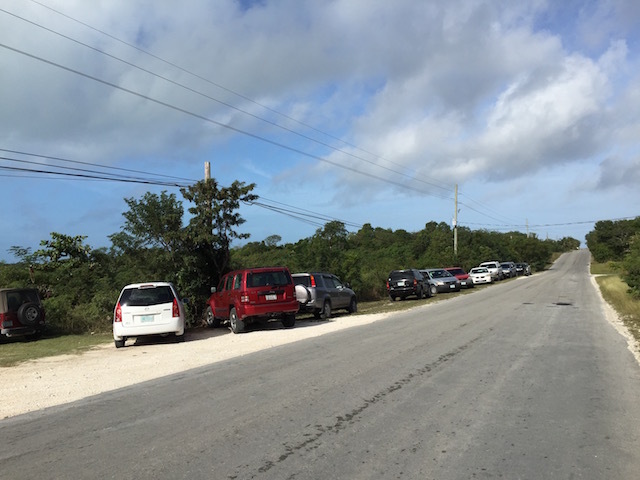 The farm opens at 9am ( closing at 4pm) and the amount of cars parked give you some indication of the popularity of the bread supply. 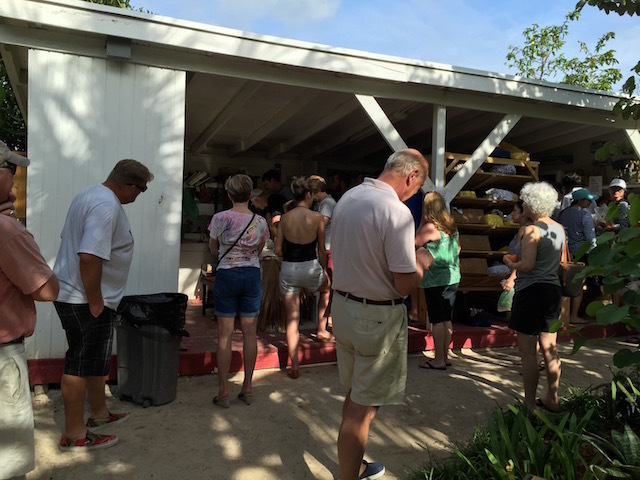 The bread is baked on Tuesdays and Fridays – but Tuesday is the most popular because of course a lot of rentals run from Saturday to Saturday. Rows and rows of goodness ! My favorite is the Cuban loaf, but I also love the Sour Dough , baguettes and I often by a cinnamon roll for my Mum. A proper English lunch is a sandwich made with fresh Cuban bread – a white bread – and then filled with grated sharp cheddar cheese and finely chopped raw red onion – a big favorite of Bob’s …… I also love the individual ciabatta rolls – I often use these to make my own sandwich…..
My own favorite things from the farm are their homemade pesto – sometimes with basil , sometimes with cilantro. Obviously this is lovely as a pasta sauce but another of my trusty appetizers is to slice a baguette, drizzle it with olive oil, spread pesto on it and then top it with finely chopped tomato – bake in the oven for about 8-10 minutes and hey presto a very tasty dish. Lovely fresh herbs and leeks….. I also love their salad dressings – I am not very good at making my own – so I rely on theirs and they never let me down. They make a great fine herb dressing and also a very good tomato based one as well. The dill butter is a very useful item to have in the fridge for cooking fish with and I also love the taboulah salad that you can often find in the fridge at the farm – makes a great lunch. 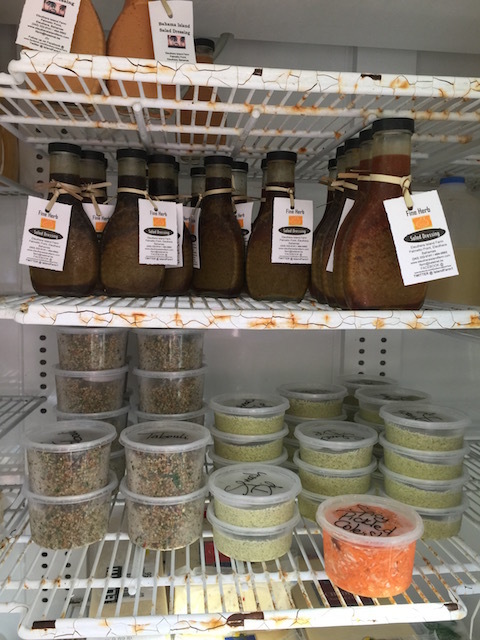 There is a huge array of hot sauces, marinades, honey and preserves which when you have to stand on line is great to browse through and of course there are plenty of bottled tomatoes and home made pasta sauce. Anne and her terrific assistant Trecia have a great talent for coming up with all sorts of imaginative new products and everything is made right there using their own produce. 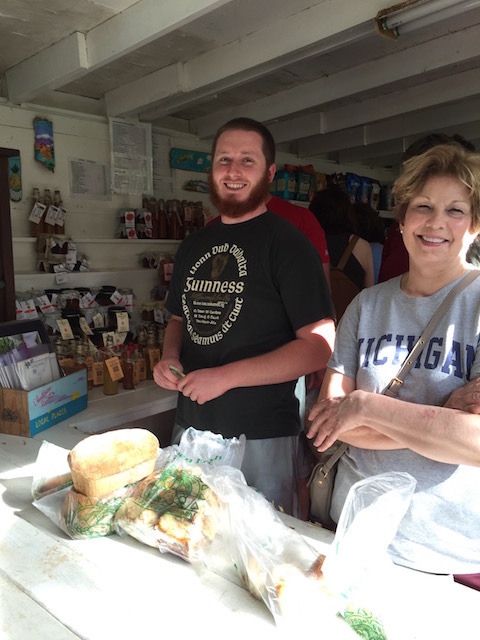 Happy shoppers – bread and cinnamon rolls ! Get ready to queue ! 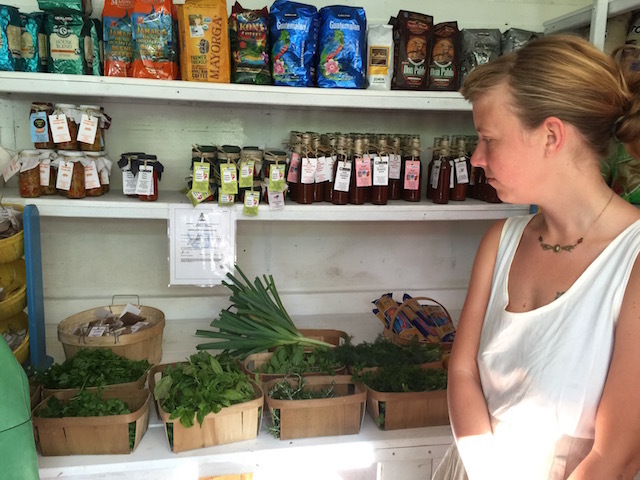 So pay a visit to the farm, treat yourself and let me know what your favorite products are ….. 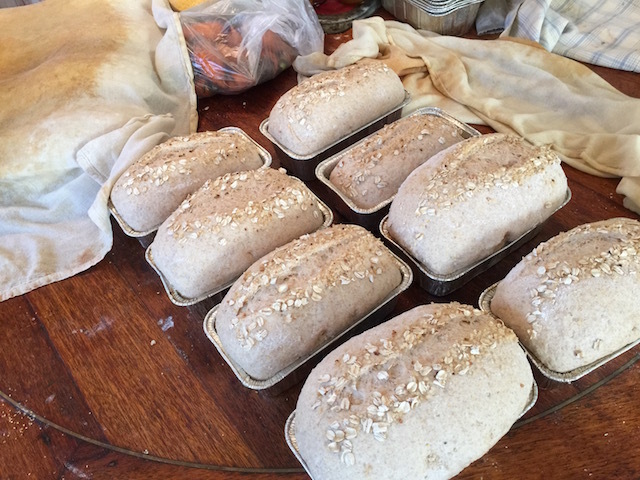 Waiting to be baked – multigrain bread….. This is my favorite food stop on the island. The cinnamon rolls are to die for, I cut them in half and feel like I am not “sinning” as much that way. I love the cheesy bread, so good with conch chowder or vegetable soup. Ann and Trecia and Clyde are wonderful hosts and will explain their goodies and let you tour the farm. 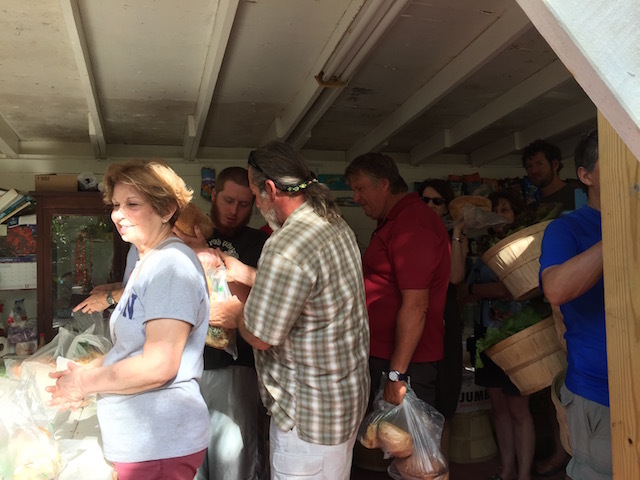 Do not miss The Island Farm! I just bought some creamy leek pasta sauce which I can’t wait to try ……. I we want a loaf of multi grain bread but don’t get into Saturday Afternoon. Do you supply any other stores with your bread & cinnamon rolls?? Banks Deli or the new Barracus Food Store????? Can we pre order for Tuesday’s??? ?